I built a printer! Thank you everyone for everything. Thank you everyone at Duet3D, here on the forum and in the greater RepRap community. 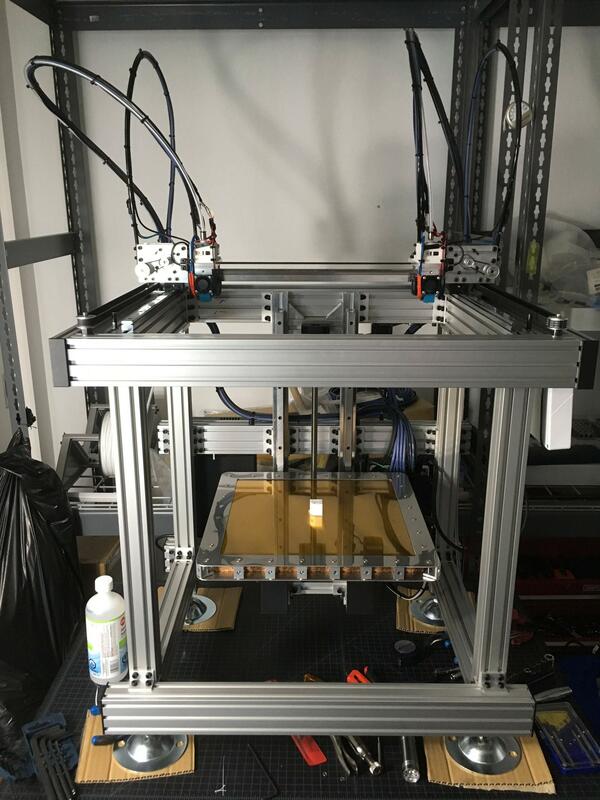 I started working on an idea for a Cartesian printer in January 2016. I finally printed the first thing on it today, and I couldn't have done it without the work, commitment, and help from everyone! Especially, thank you DC42 for the ongoing development work on the main branch of the firmware. It's amazing. Now the fun part begins: tuning and tweaking the prints. That looks really nice. Details? @phaedrux Just an IDEX cartesian built to be really sturdy, reliable, and easy to maintain/work on. It's the first one so I have a lot of testing to do to see if it works out. I tried to make it very high-resolution capable as well, with 5 micron full-step resolution on Z, and 40 micron full-step resolution X/Y. I'm surprised at the speeds and accelerations it is capable of. I was expecting it to be sluggish, but it's faster than my delta. More than solid looking and a really well though out design. Congrats on the sweet machine. Are those extruders working independently? Sorry for my noob-ness, I've never seen extruders at each end of the X axis like that. Looks great! Print some TPU shoes for those feet! That's looking REALLY awesome. 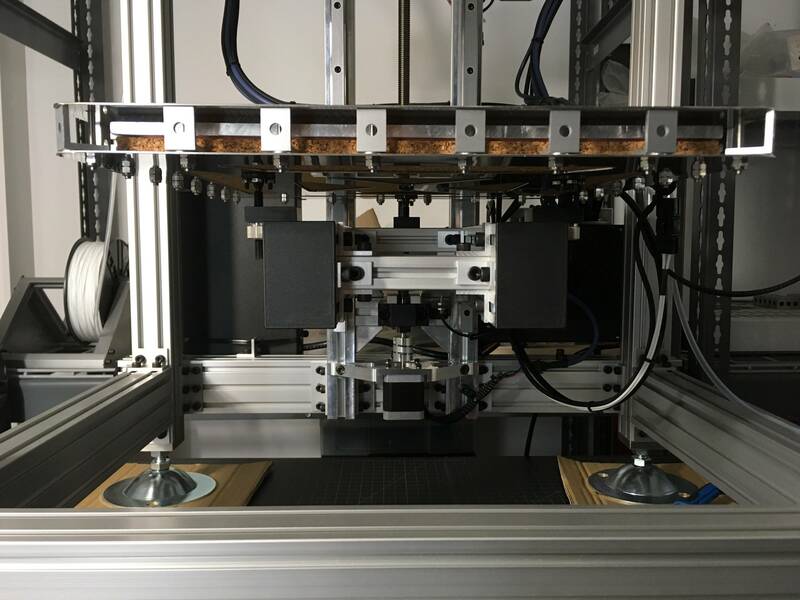 Love the dual printhead setup. You posted a video of it yet? What's the bed surface, PEI? Love the idea of two steel plates with rigid spacer blocks for the bed, Light but stiff, never saw that one, very cool. Yup. They travel together on Y but are independent on X. This type of setup is called IDEX, but I did not come up with it. I actually started designing this printer as a single extruder, but then the Spanish company BCNC came out with the Sigma and my wife told me I need to change the design to be like that and so I started re-working everything. Not a bad idea! I have a few things to work out in regards to that. The printer is supposed to go on that wire shelf behind it, but it's not very sturdy because the feet only rest on some of the wires... I think I will have to slip in some long flat pieces of steel to add rigidity or something. I was gonna slip some plywood under the metal feet or something, with a bit of rubber, but maybe custom TPU jobbies are in order... or maybe down the line for the second prototype. (I bought enough of the custom parts to make 3 of these machines, and bought the off-the-shelf parts for two so I have another coming up soon). Thanks! I do not have a video posted yet but I have a small video of the first print. Typical slow first print. Very quiet except for the fans, thanks to the Duet! The bed is hilariously not lightweight at all! I believe the bed assembly, excluding the ball screw and linear rails completely, weighs 16 kg! Lol.... yup. But I did the calculations beforehand and determined that this was within the operating parameters of the screws and linear rails, so I went for it and it works like a charm. I gotta say I started panicking when I assembled the bed assembly first and it was hard to hold with one hand! Hahaha. The stainless steel plates act more like just a clamp. 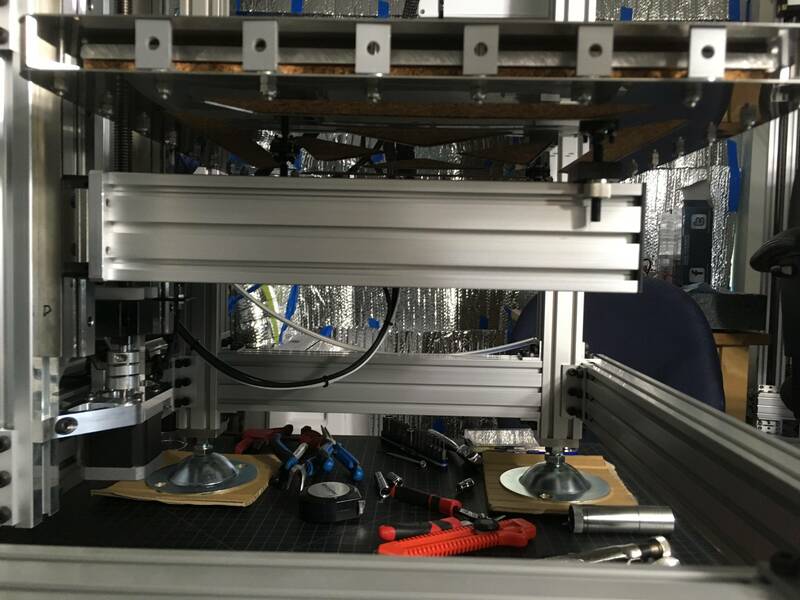 There is a Mic 6 plate sandwiched between the steel clamps, along with the thick PEI sheet, and the silicone heater, and two layers of cork. The bed is attached to the cantilever via the bottom steel plate, and the Mic 6 plate is only held by friction in the sandwhich, hopefully allowing it to expand evenly upon heating. I believe the bed assembly, excluding the ball screw and linear rails completely, weighs 16 kg! OMG! Not quite light, LOL! You could use that as a ballistic shield in a battle! It's really cool your wife is not only understanding, but helping. Mine pretends she's not very knowledgeable but I explain everything to her as I go and she's probably a better engineer than a lot who pretend to be ... she's extremely smart. (Smarter than me for sure!) She's forever saying something when I'm fighting a problem that totally solves it from an unexpected angle. Look forward to a nice "Walkabout" video where you tell some of the decisions you made and why. Catch ya later, and again, well done. Cheers! I might do a quick walk around soon, that might be cool. TBH, I'm a little bit torn in terms of sharing too much info about the printer. On the first and most important hand, I could only do this by standing on the shoulders of giants, and literally copying other peoples' ideas. I only added small improvements based on my own preferences. So in that regard, I have an obligation to share what I've done. On the other, miserable hand, we are trying to make a business out of offering print services, so sharing "too much" might cut into our competitive advantage (if any) too early. Really, though, there is nothing that hasn't been done, or at least thought of before. Nothing I'm doing is outrageously different, so I am not too worried about sharing, especially with a collaborative and interesting community like the one we have here. So, if I sometimes seem coy or hesitant to specify, that's likely where it is coming from. I hate having to survive in this competitive business world -- I wish we could all just work together, collaborate, and provide for one another. In the end I'll force myself to share, because that's why we're all here. Very nice machine. Can't wait to see what you print with it. @bot I think you must mean "perfect benchies". Beautiful machine. @dennishall Hopefully! Hahaha. Thank you. Ah ok, so I'm not alone then. @phaedrux Hahaha that is a nice big benchy. And a mini smoke-benchy coming from the stack. 3x scale as a toy for my 10 month old baby boy. I actually tried annealing the PLA in the oven to toughen it up, and so far it's taken a lot of abuse. That's tres cool. It's wonderful that our society is starting to really emphasize S.T.E.M. for women. I suspect if we came back in 100 years we'd find a matriarchal society with women in charge of everything. I get the sharing it part, do what's comfortable for you, don't feel pressured to share away any slight advantage, as you pointed out this is a great community and people will understand. Considering that the Duet boards are aimed at the higher end user, there are a LOT of people on here who are doing pro based machines that won't share E/T and we all get it. Post yer Benchies matie! People will jump in and help you fine tune that beast. Just watched the video ... Wow. That thing is industrial grade, my Friend. Nice build. Fusion 360 must be your Bioch, LOL! Nice benchie(s) ! Just as a note, although PLA itself is "chew safe" that only applies to the pure (clear) plastic. The colored PLA is food safe only if they submitted it for testing, and only a few do. I bought a Power Fryer XL that has removable shelves and found it's perfect for drying two reels at once and also annealing. I check the temps with a K type Thermocouple and they were pretty spot on with excellent regulation. The Dehydrator mode allows 5-6 hour low temp drying.